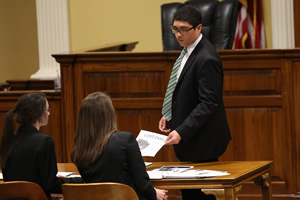 During the last two weekends in August, 36 second- and third-year students participated in the Herbert W. Peterson Trial Team Competition at Cumberland School of Law. This competition is the selection process for the law school’s nationally-ranked trial teams. A special thank you to all of the volunteer judges and attorneys who dedicated their valuable time to make the competition a success. We hope that each of you will consider returning to judge in future years. The Trial Advocacy Board student directors of the competition were Ross Barbier and Evan Chaput. University of Florida Levin College of Law’s National Trial Advocacy Tournament, October 9-11. St. Mary’s University School of Law’s 2015 Lone Star Classic, October 15-17. 2015 Tournament of Champions, October 28-31. Loyola Law School, Los Angeles, 2015 National Civil Trial Competition, November 12-16.